Even though it may not be their big day, wedding guests still find a way to complain about things that don’t conform to their liking, whether it is unwarranted or not. Because it’s in the nature of some human beings to have control over everything – we see you, Aunt Linda – the simplest thing to do when they suddenly find themselves not in a position of power is make hasty complaints to those who are. Sigh. While your Maui destination wedding is a once-in-a-lifetime experience, those who attend weddings as often as they do Sunday brunch have the tendency to see it as just another routine duty, and one they unfortunately have no problem comparing to previous weddings. While it is ultimately most important that the wedding couple is happy, keeping guests comfortable and carefree is also a duty you shouldn’t ignore. After all, it is a day you are sure to cherish for the rest of your life, and hosting it on Maui should only add to the overall experience. Maui has warm temperatures throughout the year, and combined with the intense humidity that comes as a side effect of being in the tropics, there’s a possibility of putting many guests at risk for sun stroke. Although it may be an added expense or inconvenience, making an effort to keep your wedding guests cool and comfortable can go a long way in nixing complaints from your cold-blooded cousins from Winnipeg. Whether you decide to rent outdoor canopies to create extra shade, provide ice buckets with water bottles available throughout the event, or move your wedding to a later hour, simple acts will decrease the risk of accidental overheating. During any wedding, there inevitably tends to be that family member who wants to be part of the spotlight by saying a few unasked-for words of ‘congratulations’. Not wanting to come off rude, most couples tend to allow the speech to go on anyway, though it’s not always for the best (especially after the fourth mai tai kicks in). There are a few ways to avoid this, but we encourage couples to compile a wedding timeline stating the exact people who will be making toasts and speeches. This way, guests know that there are a limited number of people who are expected (and wanted) to speak, any spontaneous rants about your past failed relationships and embarrassing anecdotes you’d rather not share with your entire wedding party don’t make an appearance in your wedding day memories. There are plenty of tasks involved in weddings and wedding planning, and it is important to keep invitation etiquette in mind when preparing your own. Unlike wedding cake, less is always more when it comes to creating the perfect wedding invitation. Keep it short, professional and to the point. By ensuring only the most important information makes it on the invitation, such as the date, time, location (mention whether your reception is at the same venue as the ceremony, including addresses), RSVP date, contact number and whether guests have to pay for their own drinks, you can cut down on a lot of unnecessary questions later on. Give yourself the gift of a wedding day free from last minute text message questions! It is best to avoid planning your wedding on a significant holiday or day of the year, for example, Thanksgiving, Memorial Day Weekend, Christmas Eve, Easter weekend, Mother’s Day or Father’s Day, etc. 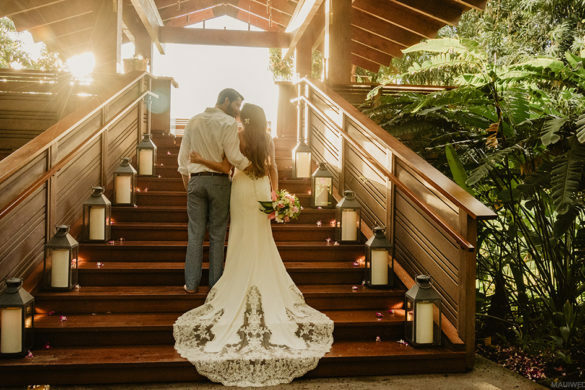 Not only are those days usually reserved for celebrating with close family members at home, but it is also when prices are at their highest on Maui, and the bridal pair will likely end up disappointed as guests will not be able to attend due to prior commitments. #5 Bad Planning – Confusion of Timing, Waiting, etc. Before your wedding day, be sure to sit down with your suppliers, bridal party, wedding photographer and Master of Ceremonies to compile a timeline of what must happen at what time, and who is in charge of what. Now is the time to call in favors from family members and your bridal party, too! Don’t be afraid to delegate tasks to responsible members of your wedding party. During the reception, it is typically the duty of your MC to keep the evening flowing and handle all the formalities. The photographer needs to plan his/her session and keep to the time schedule to prevent wedding guests from getting bored. It is also a good idea to give timelines to vendors and drivers, as well as place your timeline on tables, so that all parties involved know what part of the wedding will happen at what time. It is important that your guests are able to entertain themselves at your wedding. You shouldn’t feel pressured to play matchmaker – or babysitter – for bored-looking guests, so attempt to place people at tables where you think they might have something in common with other members of the group. Ever been to a concert or another person’s wedding on your own? Then you know firsthand how awkward it can be if you don’t know anyone and go it alone. Avoid placing the single brother-in-law with your grandma’s friends, and you should be good to go. It is also ideal to compile your table seating as close to the wedding date as possible, as you don’t know always know what issues may arise between bridesmaids and groomsmen in the midst of wedding festivities. Avoid potential drama by keeping a flexible seating chart in case relationships become strained or awkward before the big day. In some cases, the bride and the groom are lucky enough to have big families and large groups of friends who are all able to fly out for the wedding. Remember, however, to think about the implication of inviting everyone you know, even if you have not seen or talked to them in years. When a wedding is too big, the bridal pair often doesn’t get the chance to spend time with everyone at their own wedding – or worse, don’t get to enjoy enough of their own time because they’re too busy rushing around to speak to everyone. 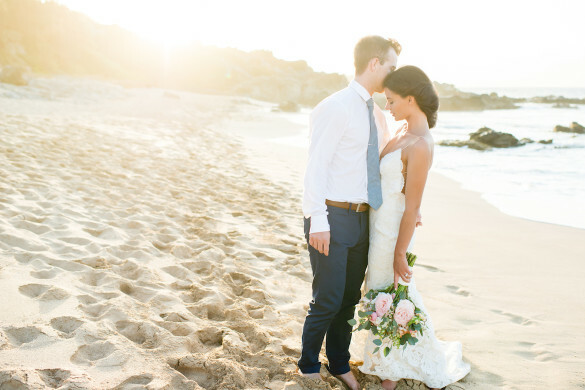 Your wedding day is your chance to soak up a truly magical and memorable day on Maui, so a good rule of thumb is to invite only those you are closest to and have seen in the last year. Maui is notoriously windy at certain times of the year, and even at certain locations and times of the day. It is advisable to do your research on the weather patterns during the period you have chosen to get married – and even ask your wedding stylist about typical conditions – before you decide on a final hairstyle. Many a bride has ended up with wedding photos featuring a pile of hair stuck to their lipstick or wrapped around their face. If you are getting married in a windy period of the year, it is best to choose an up-do style before spending a lot of money on disappointing wedding photos. If opting for an outdoor wedding, especially near the beach, you should also advise your guests of the conditions when possible. Most of the time, food is the most expensive part of your wedding. The latest trend in wedding catering is hosting a food trucks or offering buffet style dining, where guests are invited to choose exactly what they want to eat. While it is nearly impossible to make use of a set menu and simultaneously cater to everyone’s individual dietary requirements, it is polite to ask beforehand in the case of a serious allergy or potential health issue. It is important to give your guests something to do while they wait for you and your bridal party to have their photos taken after the ceremony. If you want to open the bar at a certain time, make sure you have made arrangements with your caterer or cocktail catering company, and keep drinks flowing for your guests as they mingle, get to know other and catch up with friends before your reception starts. Similarly, be sure to avoid opening the bar too early – as in hours before the ceremony begins – as no one wants to end their own wedding festivities early due to overly intoxicated guests. When arranging your wedding DJ and MC – take a look at this comprehensive list of recommended Maui DJs – it is important to ask for references, as an unfortunate DJ can definitely have a negative impact on your wedding. A great DJ will set a great vibe for your wedding, whereas a bad DJ will cause your guests to avoid the dance floor, possibly leave early and even badmouth the poor music choices. This will be a huge disappointment for your guests, as they have come a long way to celebrate with you without being distracted by annoying commentary or terrible tunes. Bonus Points: Avoid anything by Nickelback. When you arrange a destination wedding, wedding gifts should not be a requirement, as your guests have spent hours on an airplane to attend your big day. Them being at your wedding should be a great gift on its own, so avoid asking for extra presents or special favors. In fact, thank your wedding party by giving them a little gift or token of appreciation.